Latest international statistics on international producivity suggest UK lags other European nations. 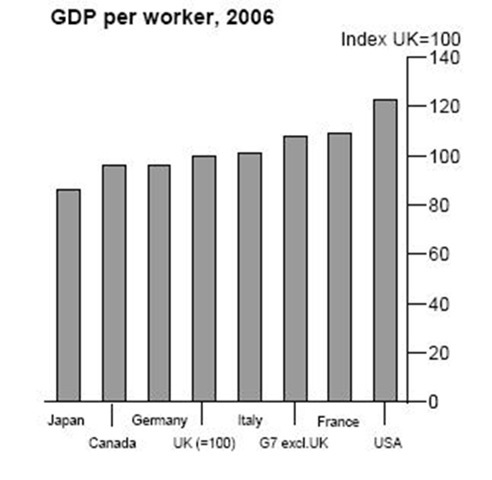 International productivity statistics for 2006 have been released today showing the UK holds on to fifth place behind the USA, France, the G7 (average), and Italy. The UK’s position in the table is unchanged on 2005 data. Since 1991, however, the UK has recorded the fastest productivity growth of any of the G7 countries. The UK grew by 38% compared to 27% for the G7 average. This growth is accentuated if productivity is measured on a GDP per hour worked basis, with the UK recording an increase of productivity of 46%.